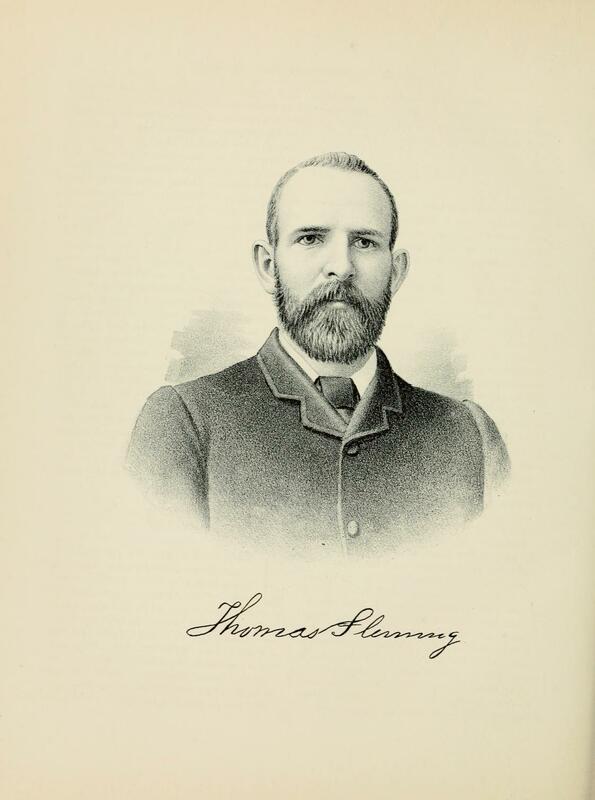 THOMAS FLEMING. The portrait on the opposite page represents a gentleman who figures among the citizens of Shelby County as one of its most wide-awake, versatile and sagacious business men. He is at the head of various important enterprises centering in Todd's Point Township, his place of residence, where he has a large store for the sale of general merchandise, a factory for the manufacture of tile, and an extensive farm, all of which are under his supervision, and are ably managed. Todd's Point Township is the birthplace of our subject, and August 3, 1858, the date of his birth. His parents, Isaac and Anna Jane (King) Fleming, were among its earliest settlers. They were natives of Westmorelandshire, England. The paternal grandfather of our subject was an extensive farmer and stockraiser of that shire, where he spent his entire life. The father of our subject grew up amid the pleasant surroundings of his English home, and received a good education in the local schools. In 1839 he started out to seek his fortune and making his way to the island of Santa Cruz, was employed there on a sugar plantation until 1850, when he again started out into the world, and coming to this county, located in Todd's Point Township, he having previously sent money to buy land at this place. At that time this section of the country was sparsely settled, the best land being owned by the Government, and since sold at $1.25 an acre. Mr. Fleming built on his land, and devoted his energies to general farming and stockraising until 1861, when he returned to England to spend his remaining days amid the scenes of his youth, and in due time was gathered to his fathers. His widow, the mother of our subject, still resides there. Three children were born of her marriage — James, a resident of Missouri; Mary who lives with her mother, and Thomas. The subject of this life-record was but a child of three years when his parents returned to England, and he was reared in the home of his ancestors, and was educated in English schools. He did not, however, in all these years forget the land of his birth, and in 1887 he came back to begin life anew in his native township, and has since been closely connected with its leading interests. He established himself in the mercantile business, and has here a commodious, two-story brick building for store purposes, in which he carries a large and varied stock of general merchandise suited to the wants of his customers. Besides conducting a good trade as a merchant, he opened a tile factory near his store in 1888, which has been in successful operation since, turning out a superior article that commands a ready sale among the farmers and all who are interested in drainage. Mr. Fleming also superintends the cultivation of his large farm, of four hundred and forty acres of excellent tillage land, lying in Todd's Point Township. Although his interests are so diversified he manages each with surpassing skill, employing systematic and business-like methods, attending carefully to details, and in all that he does making every stroke count. Mr. Fleming was married in 1886 to Miss Margaret Charlton, a native of Newcastle, England. They have a very pleasant home, replete with every comfort, and Mrs. Fleming's sister, Miss Alice Charlton, is a welcome inmate of their household. Extracted 26 May 2018 by Norma Hass from 1891 Portrait and Biographical Record of Shelby and Moultrie Counties Illinois, pages 546-547.